You come up with a great HTML layout for data-driven ASP.NET web page which makes perfect sense from business perspective and reveals key indicators while making possible to drilldown into details if needed. This page utilizes DHTML and AJAX calls to improve User eXperience (UX) and overall page looks great until… your database is not filled up and page load time is increasing due to generated HTML size, DHTML is slow due to big DOM tree and users starting to complain about it. Here is no technical challenge here – just business one: you have to sell new layout to existing users/customers and once they liked the initial one this can be really difficult. If you can do that – go ahead. There is nothing wrong with that approach. This is also not new concept – load only those parts that should be visible immediately to the user. Traditional paging explores that option although it is not that fancy. If you’re using Google Reader you probably noticed that it loads only visible part of the feed and as you scroll down it keeps loading from the RSS feed. So here is the idea: having small piece of HTML loaded would ease the browser in rendering HTML DOM tree and you gain performance. As user keeps using the page you keep adding HTML to existing DOM tree by loading it dynamically using AJAX. Utilizing these techniques could improve download time for your web apps and also speed them up because the browser doesn’t need to process whole DOM before give the control to the user. All these can be used together or in any combination as long as it makes sense from business perspective. Imaging the following situation: your team is having a meeting in which you have to decide which features, components to build for next product or service release. Or by having a specification from system analyst you have to decide how long it would take to build the desired product so appropriate offer can be made to the client. Either way it is very important what you will decide because all future changes will be around this very first decision. You are setting the expectations and this is very important for the project outcome. 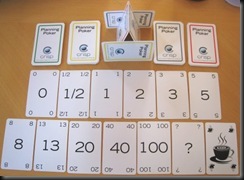 One very popular technique is asking the developers for their estimation. Once the team leader has this number it multiplies x2 and gives it to PM. PM also multiplies it x2.5 so there will be good buffer zones. This approach, funny or not, somewhere works. And there are happy customers and ISV. Yesterday I attended Seattle code camp and a very interesting session was “Agile Estimation Techniques” presented by David Starr. The idea is simple: everyone from the team has a deck of cards. Having once already solved problem/built feature by the team is set as base one at well-known cost (in man-days, man-hours, ). 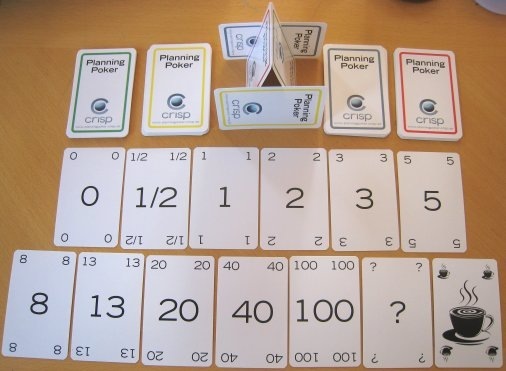 Then another upcoming tasks is put on the table and after initial discussion everyone of the team lay the card of choice representing their thinking of the cost. If there are big difference if some team members’ choice let them discuss their choice and repeat until everyone pick closer costs. "What you're holding in your hands in by far the most brilliant book about managing software teams you're ever going to find. If you’re in a bookstore, buy it immediately, take it home, and read it right now. If you’ve found this book on a friend bookshelf, steal it immediately. You don’t have time to get to a bookstore, and you can always make new friends later." Fortunately I didn’t have to spoil any friendship and I was able to borrow the book from corporate library. With a series of tales Michael Lopp introduces the reader into the world of the tech manager. Whether manager or just wannabe this book describes very interesting situations and cases which can benefit you in so many ways. If you haven’t been in such situation yet you can mentally prepare for it and have an idea of good action in the back of your head when one occurs. Ability to be in someone’s shoes is so rare and combined with good writing skills creates a wonderful must-have book. I had interesting experience today. I tried to create a web setup project for one of my recent projects. 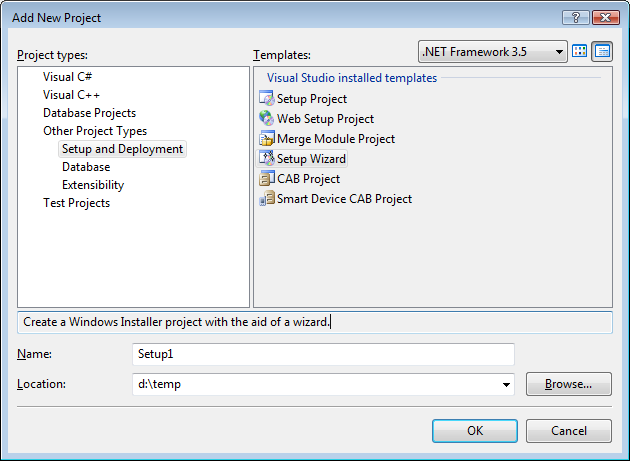 As you know it is pretty straightforward: From Visual Studio 2008 File –> Add –> New Project –> Select Setup wizard. and just add output from existing project. "The installer was interrupted before ApplicationName could be installed. You need to restart the installer to try again. Being experienced installer package developer I knew what I had to do: run the installer with verbose logging. 1: Action start 16:22:53: WEBCA_SetTARGETSITE. 9: Action ended 16:22:53: WEBCA_SetTARGETSITE. Return value 3. 11: Action start 16:22:53: FatalErrorForm. I and remembered from my MS DevDays 2008 IIS talk – you still can use old (pre v7) IIS management tools with IIS7 as long as you have “IIS 6 Metabase Compatibility” role service installed. I installed this role and … Voila!!! it works!! !